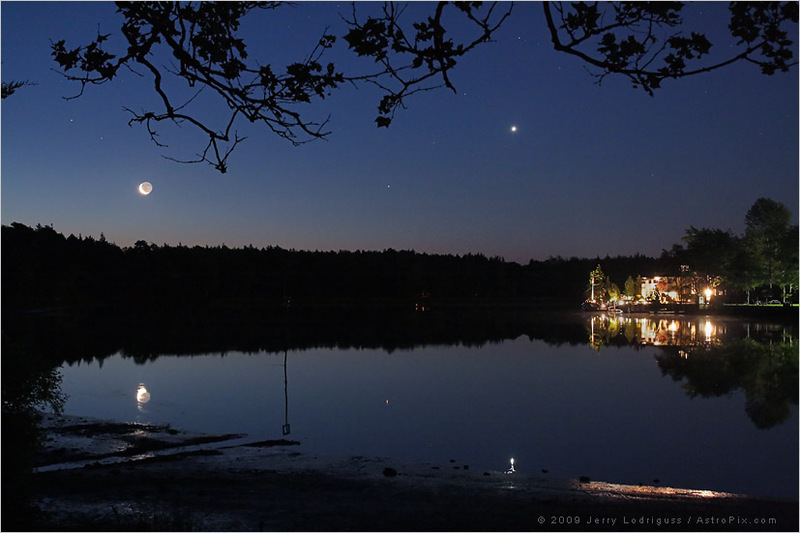 Explanation: Still waters mimic a predawn sky along the eastern horizon in this peaceful scene. The picture was recorded on May 22nd from the banks of the Mullica River, in a forested region known as the Pine Barrens of southern New Jersey on the US east coast. Near the horizon at the left is an old Moon with its narrow, sunlit crescent. Mars is near picture center and brilliant Venus shines farther right. Like the terrestrial lights along the riverbank, the bright celestial beacons are all reflected in the watery foreground. Of course, most of the Moon is illuminated by Earthshine, light reflected from the sunlit side of planet Earth itself, revealing features on the darkened lunar surface.